2011 WAS Officers Pictured are (L to R): Dawn Ballou, Secretary/Treasurer; J.D. "Sam" Drucker, President; Bob Diehl, Vice-President. 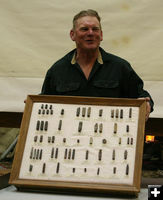 Mike Hawkins Mike Hawkins showed a collection of bullets and cartridges he has found over the years around Wyoming. These items were found on private land. The Upper Green River Chapter of the Wyoming Archaeological Society (WAS) met on Tuesday, March 15th for their regular monthly meeting. Now moving into its second year, the chapter elected new officers. The chapter plans to take field trips to archaeological sites around Sublette County in the summer and help with archaeological surveys and digs. New members are always welcome in the Chapter. The group meets the third Tuesday of each month, alternating between the Museum of the Mountain Man in Pinedale and the Green River Valley Museum in Big Piney. LaBarge resident, Mike Hawkins was the guest speaker at the March meeting of the Upper Green River Chapter of the Wyoming Archaeological Chapter. Hawkins is an archaeology enthusiast and has an extensive collection of items he has found over the years. One of the displays he brought was of bullets and cartridges he has found on private land explorations. Some of the cartridges dated back to the early 1800s, with the earliest being from a .44 caliber Henry repeating rifle. The next meeting is Tuesday, April 19th at the Green River Valley Museum. Guest speaker will be Dr. Bob Kelly, Director of the George C. Frison Institute Dept at the University of Wyoming, will talk about PaleoIndian archaeology in Wyoming. Everyone welcome. For more information, see www.sublette.com/was.